The performance of the TS-324™ and PanelCraft™ roof systems, like all other seamed systems, relies significantly on the performance of the seamer machine seaming of the panel at the clips and in-between clips. BRS has over 20 years of experience seaming the TS-324™ and PanelCraft™ systems under all types of roof configurations. Over the years we have gained knowledge on how to evaluate the completed seam of the TripleLok™ and QuadLok™ seams on both panel systems. We have used this experience and our design expertise to develop a seamer that will form the TripleLok™ and QuadLok™ seams that allow for small various panel seam tolerances and minor out of module conditions when other seamers don’t. Through years of extensive studies and many man hours on BRS licensed roofs we have learned how to keep the internal integrity of the seam maintained. Assuring the hook of our panel is fully engaged inside the seam, we know our roof system is performing to its upmost potential. The first seaming machines used on metal roofs were very slow and took up more installation time. The rolls would mark or even damage the metal panel finish more times than not. Click here to see an old seamer at work. 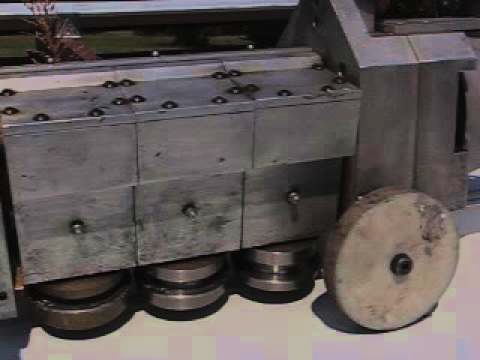 In the video you can hear the seamer slow and bog down over each clip. Early seaming methodology used seaming roll designs that were dimensioned to encapsulate each element of the seam as it is pushed into place. With this method, if the element lengths are slightly different than designed dimensions, the seamer rolls will try to force the element into the design dimension. This can result in pushing the seam element which will cause the end of the element to be moved from its design location after seaming. As a result of this development, work on seamers and hands on experience on our roofs, we have developed a program to assure ourselves, and our licensees, that the seamers rented to seam the BRS TripleLok™ and QuadLok™ seams perform as designed and tested. This program relies on close cooperation with the seaming firm renting the seamers to you or your customer’s installer. Our involvement with our approved seamer companies is very important. Open communication about jobsite issues, panel specifications and alterations of machines between BRS and a seamer company is crucial for the performance of your licensed roof system. BRS wants to protect the reputation of our licensed roof systems. By using specifically designed seamers and sound quality control system with our approved seamer rental firms we will know that our licensed roof systems are performing as designed and tested. BRS has gone through extensive efforts to help ensure our seam is being properly seamed. We made it a goal to become experts in understanding the seaming process of our two seams. We achieved a better understanding through our hands on experiences, dissecting panel seams and developing our new seamer rolls. BRS has developed a panel check gauge that drops onto the panel to check the seam sensitive elements. Line operators can check each panel run with this gauge to verify tolerances; it checks element lengths, radii, and angels. Many of our licensees have adopted this tool and is a crucial part of their quality check program. Seam dissection to evaluate material movement within the seam. Photos below show both a seam using the BRS designed rolls on the left and the other seam using rolls design that encapsulated the radius and element lengths.Notice the cut section on the left has the hook in its proper location wrapping around the clip's hook and male distal end. By viewing the pictures above, a seam may look like a proper seam from the outside, however, once cut into, the internal integrity as been altered. By forcing the material, the hook commonly disengages, negating our patented feature that our licensees value. We have mentioned how important seamers are in the past but want to stress how imperative they are to the performance of our roof system. We know from experience by using a seamer with BRS designed seamer rolls will result in the highest loads consistently in the field. Our seaming designs will form the TripleLok™ and QuadLok™ seam to achieve better performance in uplift and less problems in the field seaming, as the force to seam has been reduced through our designs. BRS and our Quality Control program assures the seamers are adjusted and perform as expected before they arrive at the job site. In addition to having developed the best standing seam roof system on the market, BRS took the steps necessary to provide the best seamer to go with because we understand the importance of a proper seam.